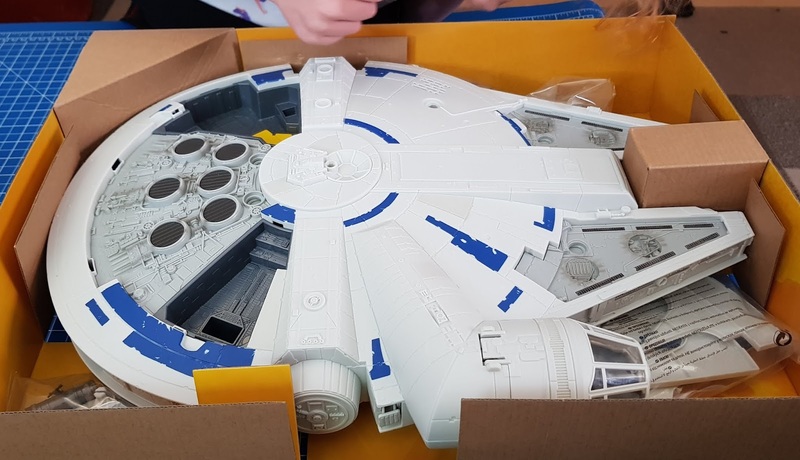 Inside the box you have the Millennium Falcon, Han Solo figure and blaster, Coaxium containers, plus all 6 of the removable panels. Two have a notch to be removed by hand and 4 are 'blast off'. 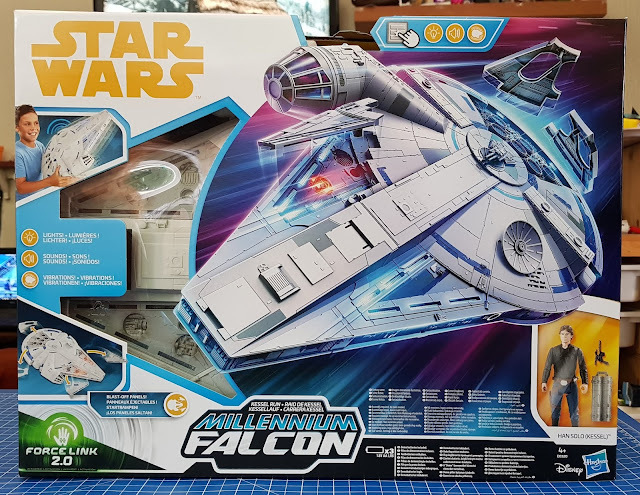 Unpacking is easy and quick, and the Millennium Falcon arrives with demo batteries which, in my experience, usually last a long time. Perfect for Christmas morning. There is some plastic packaging, but it's mainly card, and you can fit the ship back into the box for storage if you aren't going to display it. There's a small 3 way switch underneath with off, demo and play, and the battery compartment for replacements (3 x AA), but the entire ship has been made very carefully to disguise and hide all of the switches and buttons. Nothing spoils the line of the genuine Millennium Falcon. The Escape Pod simply pulls off, there are clips either side. This was hard for me to do the first few times, so younger adventurers will find this tricky. The blast-off panels have a technique for fitting which makes them really easy, always slot in the tabs first and then press the panel about 2cm away from the other edge to click it into place. This is a good sized craft, those are inches marked on my table, but it's not heavy at all and easy for a young pilot to control. It's also quite sturdy thankfully, so you don't need to hold your breath whenever your child flies it around the room. 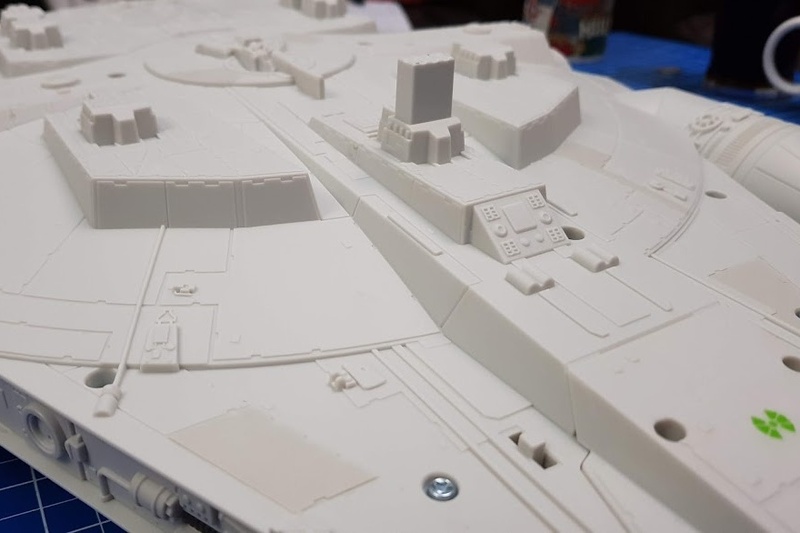 That third press activates the red lights signalling damage on the Millennium Falcon, and then the 4 blast off panels automatically release. It's brilliant, it really is. Set your ship back down on land to slow down and switch off the engines. 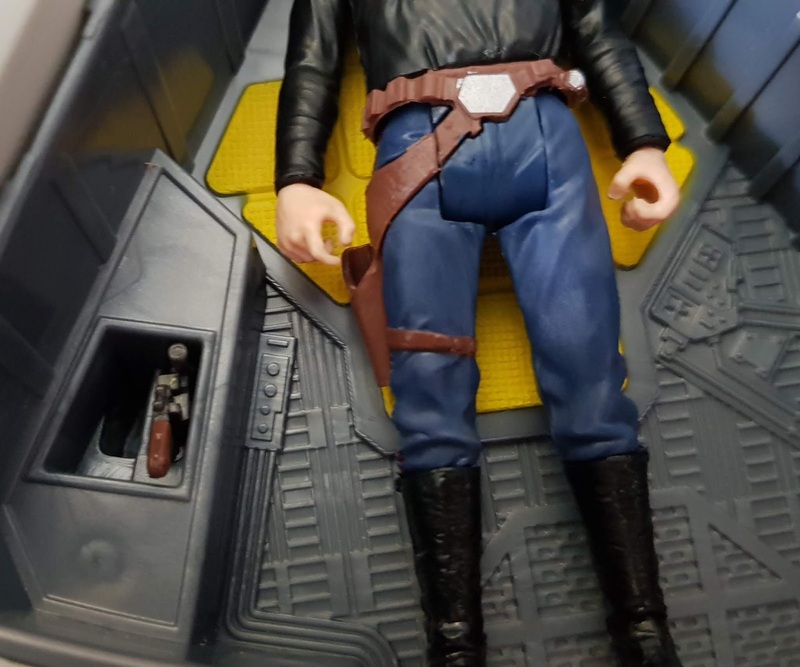 Of course your ship is nothing without it's pilot and 3.75" Han Solo is here, beautifully detailed and posable, but sadly not Harrison Ford any more. 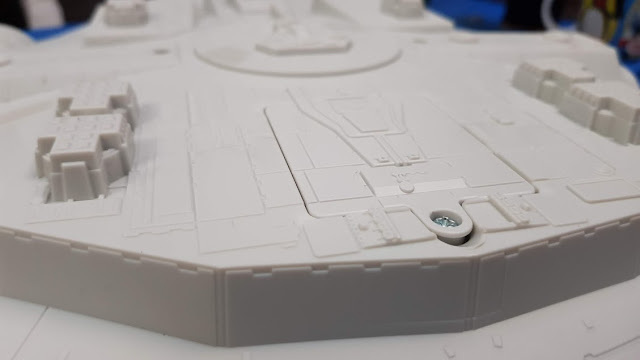 Both the ship and Han have sensors inside for the Force Link 2 aspects of this toy. We've played with Force Link 1, we reviewed the starter set and 2 figures last year, and Force Link 2 is similar, but promises to be better (see the bottom of page for an explanation of Force Link). 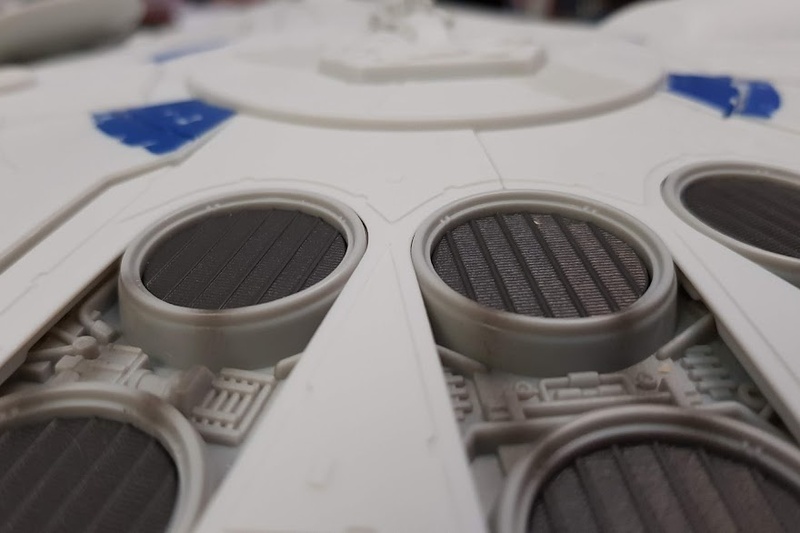 Place Han or the Coaxium containers near the special sensors and they'll initiate a noise. These include inside the escape pod and in the two smugglers hatches hidden under panels. 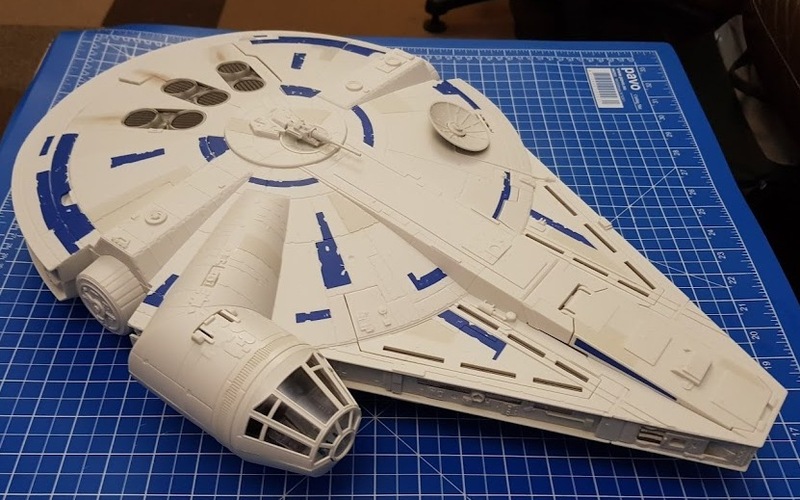 The Kessel Run Millennium Falcon & Han Solo Figure is a really fantastic toy and it makes all the sound effects and lights that you'd hope for. I'm a little disappointed it doesn't work with the Force Link 1 toys, but appreciate that advances in tech mean changes need to occur.This is a 'big present' toy and I think will be one mainly for real fans of all ages, and collectors. Suitable for age 4+, made by Hasbro and only just becoming available now. Prices vary from around £105-£135 from toy shops in store and online. Best I can find at time of typing are Forbidden Planet at £105.50 with postage or Amazon at £105.49 (affiliate link, see below). Force Link 2.0, uses Bluetooth technology and the toys interact with each other. If you have the Force Link 2.0 wearable technology, which is available in the starter set, you can activate sounds and phrases in Force Link 2.0-activated figures, accessories, vehicles, and playsets. In this case it activates figure phrases and escape craft sound FX. We don't yet - we only have the Force Link 1 wrist tech, which is not compatible. 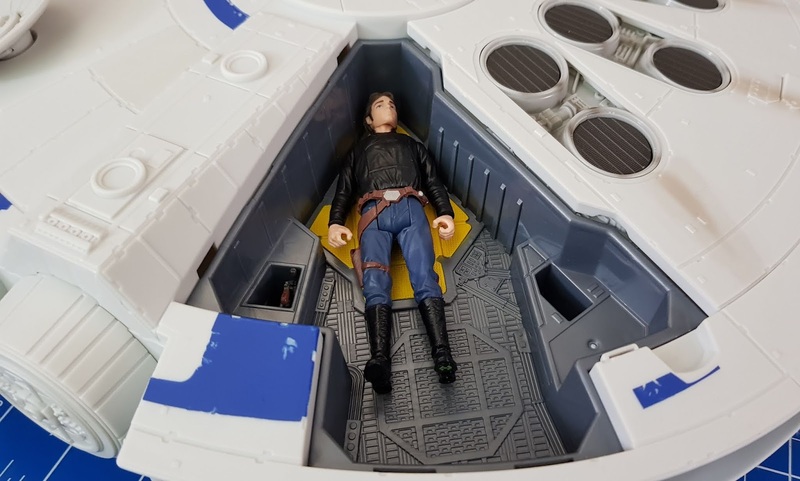 The other toys all still interact though, so even with just the Kessel Run Millennium Falcon set you can enjoy some of the technology, but none of the character sounds and talking. 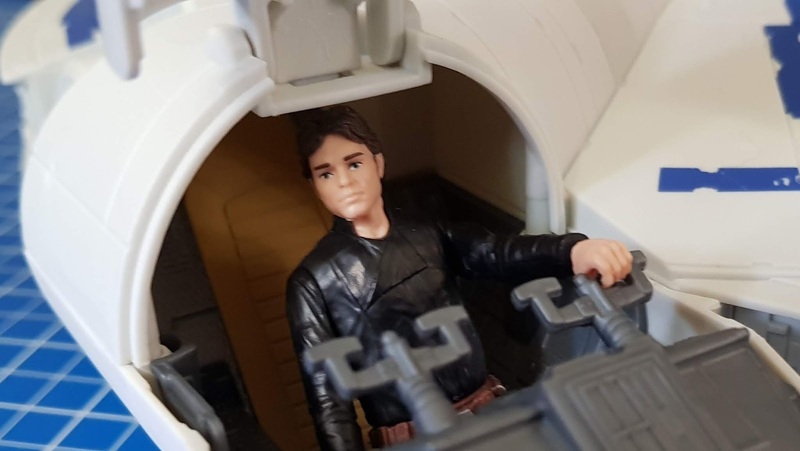 We were sent the Star Wars Force Link 2.0 Kessel Run Millennium Falcon with Han Solo Figure for review as part of the Hasbro Toy Tribe. I am an Amazon affiliate, which means if you bought this through my link, I'd get a thank you from Amazon of a couple of pounds, but you wouldn't pay any more.